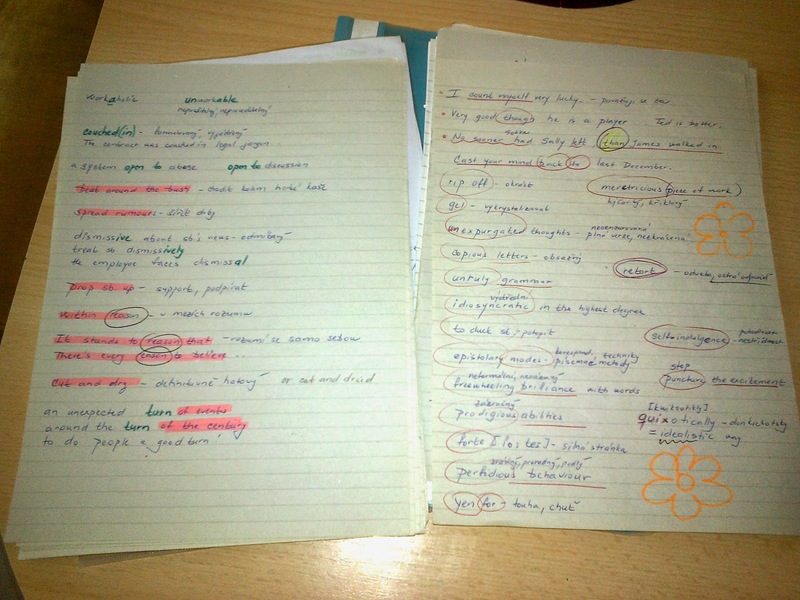 My students and friends often ask me if I could give them some tips on how to improve their English, vocabulary in particular. I always say it's dead simple and that there's no better time than holidays when one has plenty of free time on their hands. In one of my previous posts I described some of the pitfalls I experience as an advanced L2 learner. Over time I've come to realize that no matter how much I've learned there are still some areas I constantly need to work on, such as my L2 vocabulary. First of all, I need to keep pace with my students who never cease to surprise me with their immense knowledge of specialized vocabulary. Also, I feel that the more proficient I become, the more lexical, as opposed to grammatical, the nature of my learning becomes. Once I finally acknowledged the inevitability of digital technologies, I started to spend more and more time reading things online. It drives me crazy when I stare at a word which I've seen several times before, in plenty of different contexts, and I can't recall its meaning. It's irritating but not surprising; I can't retrieve it from my memory because it's actually never been there. In other words, I never really strove to make the word become part of my active vocabulary, which is why even the passive knowledge is so feeble. So I keep telling my students that in order to truly master a word, they need to learn it consciously and systematically, since a cursory glance at the word, even if on a multiple basis, is not enough. Let's say I'm reading this intriguing article called Why Grammar Lessons Should be Renamed 'Understanding Language'. This is something that really interests me - the first prerequisite of successful learning. I anticipate that I'll come across a few words which I'll want to note down, either because I haven't encountered them before, but more probably because I feel I only have a passive knowledge of them and I want them to enter my active inventory. That's why I open Quizlet. I usually create a new vocabulary set for each day - no matter how big it's going to be (I actually never know in advance; it can be just a couple of words or thirty items depending on how much I've read that day). Here's an example: first, I give the set a name and I add a short description, i.e. the title of the article. If I read more articles that day, I later edit the description box by adding another title/link or whatever. This kind of tagging helps me contextualize the vocabulary. While reading, I come across an unfamiliar word, say, 'eminent'. As I use the Chrome browser, all I need to do is to click a word for a direct L1 translation or double-click for a definition. I check the pronunciation if necessary and I also scan the synonyms. Then I add the vocabulary item to the set I created on Quizlet. I sometimes add the L1 alternative along with the definition in the English section on the right. Sometimes I type in a synonym in the left-hand column and in some cases I add the most frequent collocation or a short example sentence. This helps me to learn the word with all the nuances (at least the meaning I encountered in that particular context). Although I do this seemingly tedious procedure for all the unknown words from the article, it's pretty quick and it doesn't spoil the joy of reading the text itself. When I come back to the words later on, I first use the Flashcards tool because I can listen to the pronunciation, click to flip the cards and the best thing is that I can do so in a random order, which is beneficial for learning. Honestly, I don't really play with Quizlet very much. I'm familiar with most of its functions but I find the majority of them quite useless for my purposes. I know, for example, that it's possible to print out the sets in all sorts of cool formats and I imagine it can come handy in some situations, but I never use this option for my own language development. What I find more interesting about Quizlet is the fact that as a learner I can easily keep track of how much I've learned over a specific period of time. I know where I was at a certain point of time and where I'm now, which I find highly motivating. Also, I can tell which days or months were the most prolific and when I was pretty idle. This is good if I want to manage my time more effectively and create an action plan. In addition, I can see how much time and how many repetitions it's taken me to learn a word. I can identify which aspects of the word I still need to practise; sometimes it's just the spelling I tend to mess up, sometimes I'm only not sure about the pronunciation, etc. So this particular method of recording new vocabulary is not just a learning technique but it's also a useful monitoring device which helps me (and my students) become fully autonomous language learners.